As we creep closer to the start of spring training, today’s baseball post is about a player baseball fans are likely familiar with. Mitchell Page was a player with tremendous promise. He put up some great numbers in just two seasons in the minor leagues with the Pirates. The Oakland A’s always wanted him, drafting him out of high school in 1970, though he chose to go to college instead. The A’s made a big trade for him, getting Tony Armas, Doc Medich, Rick Langford, Dave Giusti and Doug Bair for Phil Garner, Tommy Helms and Chris Batton. it was a pretty good haul for the A’s, all things considered. Armas and Langford were mainstays with the A’s for a number of years. Giusti and Medich were near the end of their careers and did not add very much. For the Pirates, Helms was nearing the end of his career as well, though Garner would go on and have many good years for the Pirates, including helping them to the 1979 World Series Championship. Anyway, back to Mitchell Page. Page came up as soon as he was traded and took over left field for the A’s. His first year in the majors was pretty impressive as he hit .307 and had 21 home runs. He finished second to Eddie Murray of the Orioles in the American League Rookie of the Year voting that year. He had a good year in 1978 as well, hitting another 17 home runs. Unfortunately for Page, he got into a contract dispute with A’s owner Charlie Finley after that. Pretty much everyone around that time had a dispute with Finley, who was known for being more than frugal when it came to paying his players and had rid the team of anyone of any value by this point. Page was suspended in the spring, relegated to DH once the season was under way and struggled, hitting just 9 home runs and batting .247. It was pretty much the end for him after that. He rebounded a little in 1980, hitting 17 home runs but batted just .244. 1981 was a nightmare, batting just.146 even though the A’s made the playoffs. he was left off the playoff roster and spent most of the next couple of years wither in the minor leagues or on the disabled list. The A’s released him in the spring of 1984 and he hooked up with the Pirates, his original club. He only got 12 at-bats with the team in 1984 and none in 1985, spending the whole time in the minors, before he was released and his career ended. Page bounced around as a minor league and major league coach for years, spending time with the Royals as first base coach and then spending a number of years with the Cardinals as their hitting coach. He was their hitting coach in 2004 when they made it to the World Series and lost to the Red Sox. He spent 2005 and 2006 with Nationals organization and then coached again for the Cardinals organization in 2010. Sadly, Mitchell Page passed away in 2011. he was known to have his demons and an alcohol problem and was a heavy smoker as well. He had left his jobs with the Cardinals and Nationals for “personal reasons” along the way. He was only 59 when he passed away. Page had a lot of promise as a young player and maybe he just lived too hard of a life and it caught with his ability at a young age, an all too familiar story for a lot of young ballplayers. I always liked him as a player as he had some home run power and could run pretty well when he first came up. I also had an affinity for those 1970’s A’s teams even though I was a Mets fan. They just had some great characters on those teams who were also good ballplayers. Page at least got a chance to share some of his baseball wisdom with younger players in his years as a coach. I have a couple of autographs from him that I got from him back in 2010. He was nice enough to sign a couple of old cards I had, including this one from the 1979 Topps set. 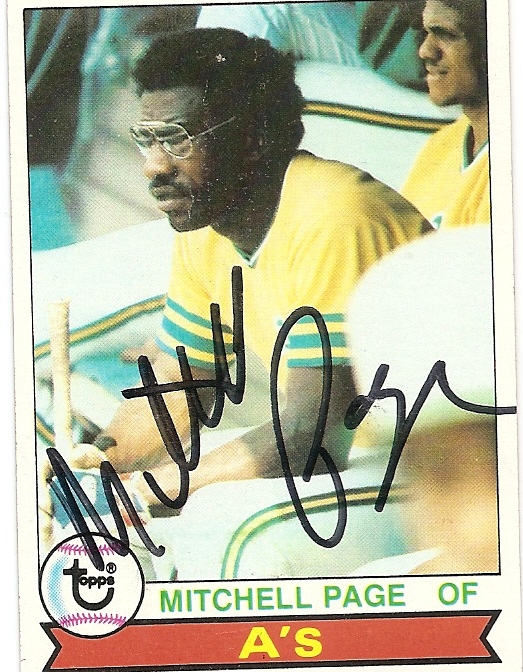 Anyone have any memories of Mitchell Page? Feel free to share them in the comments below. Also, if you have any players you might like to see featured, feel free to ask. I have thousands of autographs, so there’s a good chance I might have one from someone you are interested in. There will be another baseball post next week and a couple of regular posts from me along the way. Until next time, only a few more days until spring training officially starts!